1.Sturdy wire frame stands up to everyday use in bathrooms, bedrooms, laundry rooms or closets, while the exterior thick canvas lined with a soft fabric interior for easy cleaning. 2.Each red basket has cotton rope handles on both sides for easy transport make everything easy to grab and move. Handles on each end make carrying it convenient and comfortable. 5.Creative storage basket to store your kids toys and other messy things. You'll never have to sweat again about how to make your kids room clutter-free and organized. 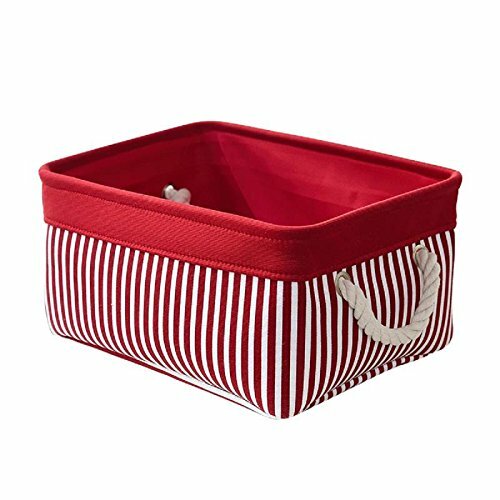 6.Modern and stylish design perfect for room decor,This cute fabric basket perfect for organizing a clothing closet, bathroom,living room or even an office. It is so universal and can work anywhere you are looking to get organized. Sturdy wire frame stands up to everyday use, This small basket great for books,magazines,toy storage,dog toys basket,shoe basket,clothes basket,shelf,baby bin,pet toy storage,towel basket,blankets,decorations,office supplies,DVD and gifts,Decorative basket ideal for living room,bedroom,bathrooms,utility room,kids room,Nursery Room,craft ,while the exterior thick canvas lined with a soft fabric interior for easy cleaning. Each basket has cotton rope handles on both sides for easy transport make everything easy to grab and move.Handles on each end make carrying it convenient and comfortable.This fabric basket is made of durable linen &Thicken Environmental EVA,sturdy metal rod frame around the top keep the basket shape,Durable and high quality material make this storage basket last a good long time.It is able to hold ton of stuffs and can last a lifetime.Lined with a thin muslin fabric. If you have any questions about this product by TcaFmac, contact us by completing and submitting the form below. If you are looking for a specif part number, please include it with your message.